She still needs to be scanned & properly varnished before I can offer prints or the original for sale, but soon enough she’ll be in the shop! This particular painting & my disrupted process as of late has got me thinking about a question I get asked fairly regularly – how long does it take to complete a painting? In this case? About a year. The painting itself was completed in the span of 3 days. I did the background on 1 day. 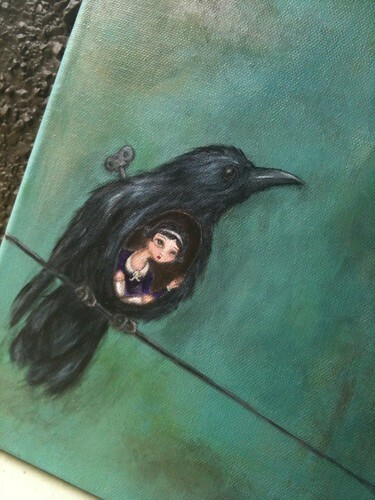 I painted the bulk of the girl & the crow the next day & then added more shadows & highlights & finishing touches on the 3rd after I’d had a chance to see it in the daylight. But that doesn’t include the sketching part of the process. I’ve got a sketchbook full of bird girls, sisters of the very first Caging the Forest Bird. That doesn’t include the time to research source material. The internet certainly makes it easier to find pictures of things like crows, but I usually prefer thumbing through the illustration archive books I have collected that show detailed etchings of various animals. That also doesn’t include the years of practice & classes & study to develop my style. And I’m just starting out in my career! For a full time artist who’s been working for 20 years, it is the sum of his experience that is poured into each new work. How many hours it takes to make something is often called into question when determining cost, especially with craftspeople. I think sometimes we forget all of those other hours, days, years spent allowing the perfect blend of ingredients to come together. It looks lovely, and thanks for sharing your thoughts on time taken to complete/work through. Not including thinking time, my own pieces take very little to complete If I added in thinking time (and now design time since I’ve started using a sketchbook) there is a lot more involved. Some pieces are completed in little stages over many days, with the cumulative time going into the pricing formula. I still don’t think I have it as a running process though. I kind of hope I never do.